Substance [sub'-stuns] is the material, or matter, of which something is made. Substances are physical things that can be seen, touched, or measured. They are made up of one or more elemental parts. 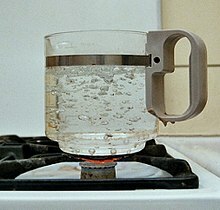 Iron, aluminium, water and air are examples of substances. The main problem of a clear definition of what the substance is that if, for example, to consider not just the universe (cosmos), being and non-being, and in general all, the question arises, what is the constant basic principle (attribute) is the basis of the substance, which generally consists of all (that is, matter, mind, senses, space, soul, and so on). The Latin word substantia - a translation of the Greek word for the essence (ousia), and in Latin to describe the essence of using the word essentia. In ancient philosophy substance is treated as a substrate, the first principle of all things (for example, "water" of Thales, the "fire" of Heraclitus). In modern times, the concept of substance is treated and spread widely. The first view is connected with an ontological understanding of substance as ultimate bases being (Francis Bacon, Benedict Spinoza, Gottfried Wilhelm Leibniz). Central category of metaphysics in philosophy substance is identified as with God and with nature and determined as the cause of itself (Latin causa sui). The main characteristics (attributes) of a substance from Benedict Spinoza are thinking and stretch. By analogy with the philosophy of Benedict Spinoza substance considered in the light of the concept of René Descartes and Leibniz. The first substance is a unity of subject and object, and the second - the same atoms are simple beings who lose their stretch, but receive attribute aspirations (Fr. appetition) and multiplicity. Thanks Leibniz substance begins to associate with matter. The second point of view on the substance - an epistemological understanding of the concept, its capabilities and the need for scientific knowledge (John Locke, David Hume). Immanuel Kant believed that the law under which any change in the substance of events and the number of stored it in nature remains the same, can be attributed to the "analogies of experience." Georg Wilhelm Friedrich Hegel defined substance as the integrity of changing, transient side of things, as a "major step in the development of the will." For Arthur Schopenhauer substance - matter for David Hume - a fiction, the coexistence properties. This page was last changed on 18 October 2016, at 05:52.